The Security Gateway Solution (SGS) from TeamF1 is a comprehensive turnkey software package that combines a rich set of field-proven, standard components with an array of customizable options to provide OEMs/ ODMs the ultimate in product flexibility. As a member of TeamF1’s TFOS line of innovative prepackaged solutions, Security Gateway Solution enables OEMs/ODMs to deliver leading-edge VPN/firewall gateway devices to the market in record time at far less risk than traditional development approaches. 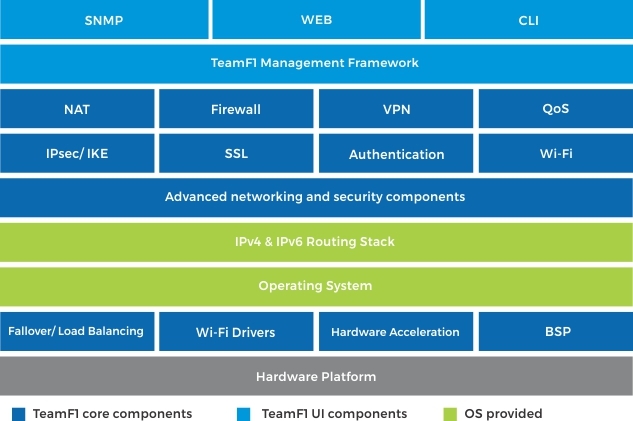 Devices built around TeamF1’s SGS offer end-customers ironclad, advanced networking security; easy-to-use device management features; and multiple gateway options. In order to create specific instances of TeamF1’s SGS, TeamF1 leverages pre-existing software blocks that have proven their merit in numerous deployments, not only minimizing risk for OEMs but also keeping licensing terms flexible. And only TeamF1’s SGS can offer such a comprehensive set of features with completely modular packaging that allows for full customization to meet an OEM’s specific requirements.